Guestlist - Sign-up and discounts! ? Karaoke - It’s time to sing! ? Have you been waiting for that moment to show off your talent? Ever wanted to see what shower singing is like without the water? 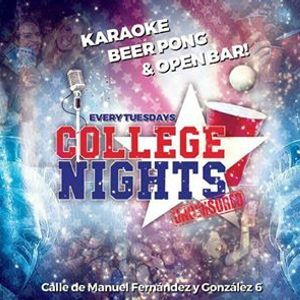 It’s time for Karaoke Night where all singers are stars! There is also open bar of beer and sangria as some rock gods need a little bit of liquid courage. Beer Pong Tournament - Time to play! ? ✓ Come early to sign up - first come, first serve! * Winners of the 2. Prize will get their bottle at the following week’s College Nights event. Birthday Specials - Celebrate it the right way ? 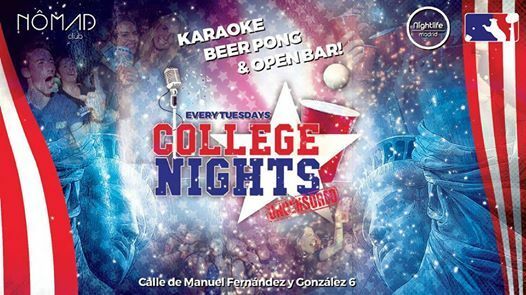 Celebrate your birthday at College Nights! By reserving your birthday night with us you will get the same benefits as of the guest list plus we will give you a FREE BOTTLE of CHAMPAGNE (group of > 6 people)! Just send us a WhatsApp to +34 693 939 352. WHEN: 22:30 - Come early to reduce waiting time! If you'd like to see a selection of events we host in Madrid, be sure to visit our website and Facebook page!